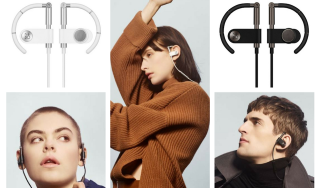 Bang & Olufsen is looking back to some of its classic designs for inspiration as it today announces the arrival of its B&O Play Earset wireless headphones. Building upon a design first established by Anders Hermansen in the 1990s, the earphones are said to take particular care with the comfort of their fit. Each is fully adjustable, with the bud sitting on a raising and lowering piston, sitting on a stem that also allows you to tweak its rotation too. The over-ear hooks that keep them in place can also be adjusted, flexing and bending to allow for three dimensions of movement. Inside, the earphones make use of a 14.2mm speaker unit and neodymium magnet. Acoustic vents around the enclosure and a bass port aim to deliver a rich sound (with digital equalisers in the Bluetooth chipset aiming to reduce a quality drop when receiving audio), interesting as the earbuds are designed to sit just within your outer ear, rather than sitting in the ear canal. Boasting five hours of battery life per charge, the earphones are finished off with an inline remote that works to activate either iPhone's Siri voice helper or Android's Google Assistant. Priced at £269 / $299 (and AED 1,199 in the Middle East), the Earset launches in a "graphite brown" shade today, with a white version following on June 1.